That most honorable of Awards, the DDG Stocking Stuffer of the Year Award, has found its luster stained of late. The last three years running, 2015, 2016 and 2017, were marred by the unseemly spectacle of our judges awarding the top prize to themselves. Though steps were taken to avoid this odious outcome these last two years, those measures proved ineffectual. Clearly stronger and more potent safeguards were needed to insure a return to the state of unblemished integrity the award had earned in the past. This year I chose to interrogate potential judges in a manner so direct that there would be no possibility of moral backsliding. 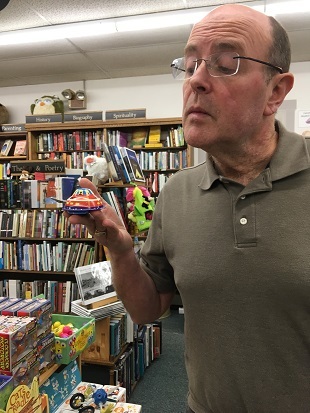 The Judge who emerged from this investigative inferno was The Erratic Invader, a Clockwork Spaceship from a bygone era of ethical behavior in toys. Kenny: Can you swear to me that you will not grant the Stocking Stuffer of the Year Award to yourself? Erratic Invader: I did not unwind my way across the stars to perform an iniquitous deed. Kenny: Can you clearly state your answer as a yes or a no? Erratic Invader: The moral compass of the stars is infinite. It will brook no prevarication. Kenny: Right. So you will you, or will you not, give yourself the award? Erratic Invader: I will not. No! Kenny: Excellent. Let us start with the Best Construction Toy Award. 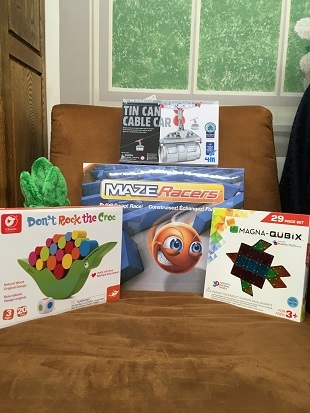 Our finalists are Maze Racers, Magna Qubix, Don’t Rock the Croc, and the Tin Can Cable Car. Erratic Invader: First of all I am disqualifying two entrants. Don’t Rock the Croc is not truly a construction toy – it is a balancing game. A worthy one, but I can brook no falsity. Secondly, Magna Qubix is identical to the Geomatrix toy that took part in last year’s awards. It is a magnificent toy but that is not the issue here. Kenny: Wow! That seems a bit tough but I can see that I chose wisely in making you Judge. Erratic Invader: The Tin Can Cable Car is a very fine kit and a fine means of transportation. It is always happy to assist other toys by giving them a lift. Yet my choice for the award winner is Maze Racers. Its combination of dual marble maze building, and competition, along with its stellar design, makes it a true champion. Kenny: Totally agree! And what is your pick for Cutest Plush Toy? 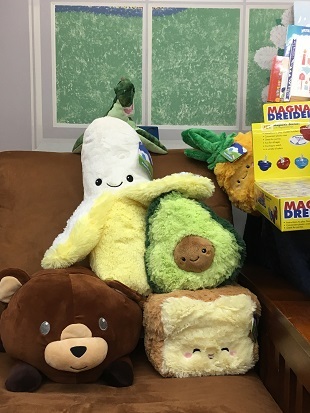 Our finalists are the Banana, The Avocado, The Bear and the Loaf of Bread. Erratic Invader: The banana is very good natured. Note how cheerful he is despite the Plesiosaur above him looking hungrily down! The Loaf of Bread is warm and comforting. The Bear is a fine fellow and also a comfy pillow. I am very fond of the Pineapple even though she wasn’t even chosen as a finalist. However, none of these prevailed. The Avocado is native to my home planet, Zenafir, and she is the winner. Kenny: Is that really a legitimate reason for victory? I mean I actually would have made the same choice but, hey hey, put down the ray gun. I didn’t mean to question your integrity. Erratic Invader: My judgment is unbiased and sacrosanct. I did not journey through the celestial abyss to make unfounded prescriptive judgments here. Kenny: Understood. 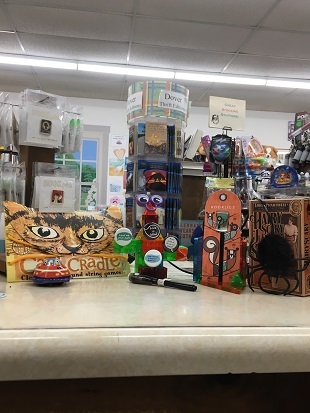 Okay, what of The Most Shockingly Great Value, the finalists for which are The Hairy Jumping Spider, Cat’s Cradle, Google Eyes Ring, and the Rainbow Wands? Erratic Invader: Ah yes, I note that many of the nominees for our final award, that of the glorious Stocking Stuffer of the Year, have wandered down to be in this photo along with the penultimate award nominees. Their excitement is most understandable. As to the Most Shockingly Great Value, The Google Eyes see all, and say nothing. Laudable but a bit too spiritual for this category. The Rainbow Wand takes the classic theme of a paper lantern yo-yo and produces it with exceptional quality for the price. It is remarkably sturdy. The Spy pen is glorious and possibly necessary. My winner, however is the Hairy Jumping Spider, which has offered to accompany me on my return journey and busy itself scaring off the loathsome Maleton Hordes who afflicted me on my journey here. Kenny: A noble offer but is that really… okay okay! On to our final category, The Stocking Stuffer of the Year Award. 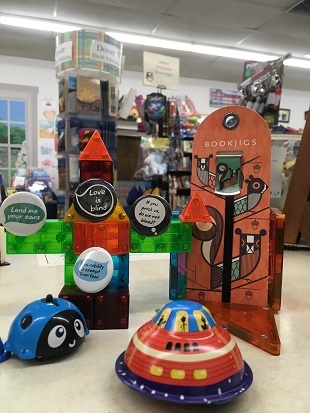 Our nominees are the Finger Elf, The Bard Buttons, and The Bookjig. Who is the winner? Erratic Invader: The Finger Elf is a sensational toy, a spinning top which is also a powerful wind-up toy. It can do tricks, battle, and yet also work together with other Finger Elfs. Astounding. Frankly I found her aptitudes a bit unsettling in that persons of lesser sensibility might find the Finger Elf superior to me in some regards. The Bard Buttons are both pithy and fun. A worthy choice. The Bookjig is a truly outstanding bookmark. Its ability to make a classic ribbon bookmark portable, along with its charming graphics, make it a true standout. All the finalists would have been worthy of the award were there not someone else present whose qualities are transcendent in every regard. And thus they must all be passed over. It would be an abomination not to select that quantum entity for preeminence today. 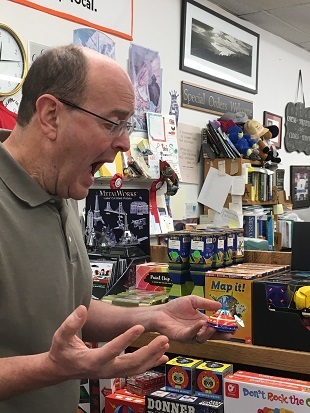 I therefore name myself, The Erratic Invader, the 2018 Stocking Stuffer of the Year. Kenny: You swore to me that you would not name yourself the winner. You said that your Moral Compass was infinite. Erratic Invader: The moral compass of the stars is not akin to that of earth. The viscous morass of earthly values has no import for one who has conversed with the populations of ten thousand worlds. You should be honored to have me deign to accept this award! Kenny: *&^%&(()& shameful (*&#^&( disgraceful. This entry was posted in Uncategorized on November 29, 2018 by Kenny Brechner. This has some similarities to Supreme Court nominations. Will there be hearings? Apparently some were held last night among the sidelines themselves Carol!